Practice l ink.com F A ll 2018 69 the C ontra C ts & C ompensation issue other offers received," explains Van Camp. "Is it a number you will be able to maintain when you convert to a productivity model?" How should physicians prepare for negotiation? When you're applying for a position, it's important to learn as much as you can about the organization and the department ahead of time. Maycie Elchoufi, M.D., says preparation is key in advance of a negotiation. Elchoufi, who is board certified in internal medicine, says you can learn a lot through a few well-targeted internet searches. Get an understanding of the organization so that you can ask questions in person about the organization's leadership, its strengths and weaknesses, goals, challenges, competitors, funding and turnover rate. "These types of questions are important because you need to have a clear understanding of whether this organization's trajectory is aligned with your own professional and personal goals," she explains. Frugé says this background research shows when candidates respond to offer letters. She says some candidates are "very savvy on business and economics of hospital vs. private employment models" while others are not. She recommends that physicians read about compensation models and try to understand RV u s, contracts and other pertinent details. (See page 47 for a start.) 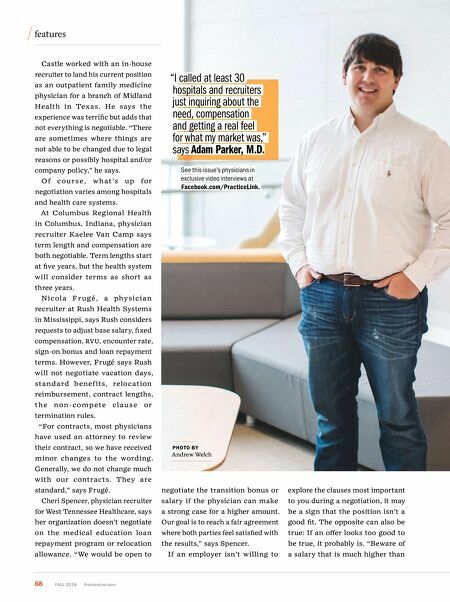 Adam Parker, M.D., just completed his internal medicine residency. He prepared for his job search by first getting a feel for the landscape: "I started early in the fall of my last year in residency and began by using PracticeLink and other such websites to find available jobs for my field in my area and in adjacent states." "I cast a wide net to get the best possible offers," Parker says. "I called at least 30 hospitals and recruiters just inquiring about the need, compensation and getting a real feel for what my market was." Parker worked with Frugé and began a position with Rush Foundation Hospital this summer. Spencer suggests physicians just coming out of training speak with a colleague in a practice setting similar to the one they're targeting. She often works with residents or fellows who only get advice from physicians in academic settings, and she says this advice does not always transfer well to private practice or hospital employment models. Spencer says she always reminds newly tra i ned physicia ns that they a re not expected to know contract language. She encourages them to hire attorneys if they are uncomfortable negotiating. "I also tell them to know their worth and pay attention to the need of the practice or hospital," she says, adding, "Negotiation is la rgely supply and demand." Elchou f i says she's always hired an attorney rev iew her cont ra c ts. 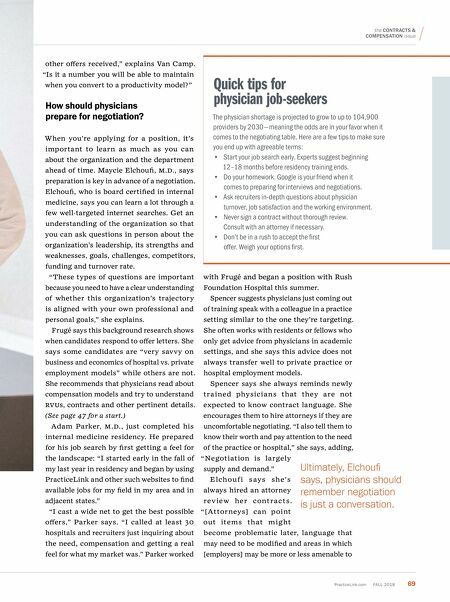 "[Attorneys] can point out items that m ig ht become problematic later, language that may need to be modified and areas in which [employers] may be more or less amenable to Quick tips for physician job-seekers The physician shortage is projected to grow to up to 104,900 providers by 2030 — meaning the odds are in your favor when it comes to the negotiating table. Here are a few tips to make sure you end up with agreeable terms: • Start your job search early. Experts suggest beginning 12–18 months before residency training ends. • Do your homework. Google is your friend when it comes to preparing for interviews and negotiations. • Ask recruiters in-depth questions about physician turnover, job satisfaction and the working environment. • n ever sign a contract without thorough review. Consult with an attorney if necessary. • Don't be in a rush to accept the first offer. Weigh your options first. Ultimately, Elchoufi says, physicians should remember negotiation is just a conversation.